August 25, 2015 - (PENSACOLA, FLA) - Hy-Lite®, a leading manufacturer of acrylic block, glass block and decorative glass windows, has introduced a comprehensive new product catalog and informational brochure. Entitled "Privacy by Design," the new pieces look at the contemporary, transitional and traditional privacy windows available from the company. The literature focuses on the theme of "Your Home. Your Style." and offers detailed information on a wide range of products. The Decorative Glass Windows section covers Hy-Lite's eclectic new Home Designer Collection™, the Bath-Lite® Series, fixed windows, architectural shapes and awning and casement windows. The Acrylic Block Windows section of the pieces focus on popular acrylic blocks used in the company's fixed and operable windows, shower walls and wall partitions, door inserts and interior shutters. A special area is dedicated to commercial use of acrylic block products. The final section of the literature looks at True Glass Block Windows. "These fresh, new literature pieces have an updated look, inspiring new photography and comprehensive product details," says Laura Sikes, marketing and national accounts manager for Hy-Lite, a U.S. Blocks Window Company. "Whether used in a showroom, on the jobsite for product selection or by homeowners making a window choice, these pieces make it easy to choose privacy windows to complement any home style." Sikes points out that the company's newest line of products, the Home Designer Collection, plays prominently in the literature pieces. "Our Hy-Lite Designer Advisory Council worked with us to create this new series of decorative glass windows," says Sikes. "For these windows, modern clean lines are mixed with textures and three-dimensional elements in an eclectic and exciting mix of innovative styles. The Metro, Mission, Prairie and Baroque windows all add exceptional beauty to the home." 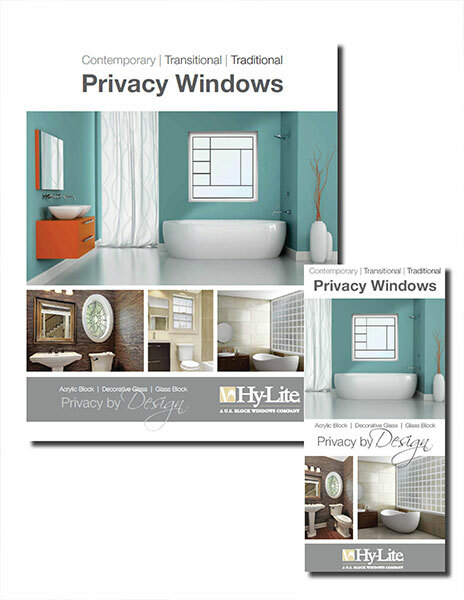 The 26-page Privacy by Design catalog and the quad-fold brochure can each be requested for free by calling 1-888-256-2599 or by sending a request to productinfo@hy-lite.com.